For outdoor enthusiasts, the western states offer famous whitewater rafting opportunities. But travelers seeking waterborne thrills should not overlook the East Coast's New River, which winds through North Carolina, Virginia and West Virginia. Rapids are generally found where a river flows from a higher elevation to a lower one. Rapids are sort of like mini waterfalls -- the falls are just not as dramatic as a sheer, 90 degree drop. They also make for a thrilling ride in a large rubber raft. The New River flows from south to northeast through West Virginia, until it joins the Gauley River and forms the Kanawha River. As it snakes its way through tree-covered mountains, it offers some of the best whitewater rafting on the East Coast. River Expeditions is an outfitter and resort offering rafting trips from April through October. Because the rapids range from white-knuckle harrowing to only mildly challenging, there are different trips to match different skill levels. For example, River Expeditions offers three different trips, starting with "Family Class trips." These trips cover a stretch of the New River that offers "easy to moderate rapids, tranquil pools, and amazing scenery," the company says on its website. Children as young as six are allowed on these trips. The next step up is the "Adventure Class," featuring rougher water and "roller coaster" waves and rapids. The trip is recommended for beginner to experienced rafters and children as young as 12 are allowed. "World Class" trips are only recommended for experienced rafters, since this run includes steep drops and wild, churning water. The minimum age is 16 and the company says rafters should have gone on an "Adventure Class" trip first. The River Expeditions Adventure Resort is in the middle of the New River Gorge, in Oak Hill, WVa. The resort itself offers cabins, from rustic to luxury, as well as a bunkhouse and RV park. Ace Adventure Resort is another outfitter serving the New River in West Virginia. 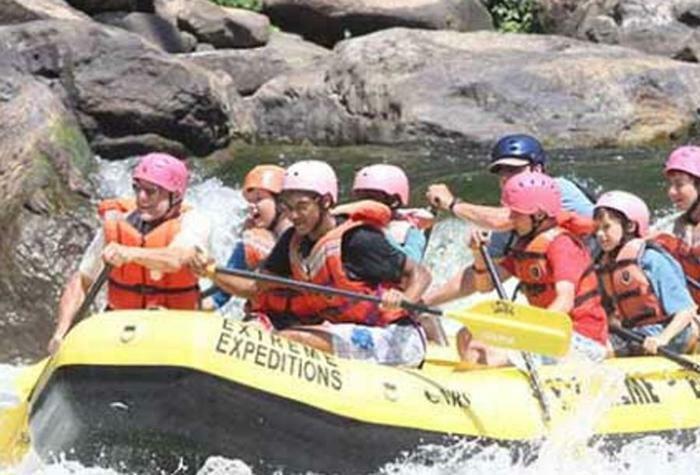 It also offers different rafting packages, geared to different experience and skill levels. There are full-day and overnight trips on the more tranquil Upper New River, which Ace describes as family and kid-friendly Class I to Class III rapids, separated by plenty of still water for swimming or relaxing. The Lower New River offers more challenging water, but is said to be suitable for beginners. The minimum age is 12 and Ace calls it its most popular trip. Half-day and full-day trips are available. The Gauley River float is the most challenging outing, with the age limit at 15. The outfitter says you need to be mentally prepared and in good physical condition. This stretch of the river has Class V rapids and boulders the size of a house. The resort offers lodging in the form of cabins, cottages, and camping. It also features a water park. The resort is located east of Oak Hill, WVa., on Route 17. To get to either of the New River whitewater resorts, it is best to drive. Take I-64 or I-77 to Beckley, WVa., and make your way east. Air travelers can arrive at Raleigh County Memorial Airport in Beckley, which is served by ViaAir, a commuter airline serving smaller airports. There are better connection at Yeager Airport in Charleston, WVa., about 75 miles away. That airport is served by American, United, Spirit, and Delta.